unctuous bone marrow on crispy sauteed butter bread from 85c Bakery. not for the meek, nor the weak...no pansy palettes allowed at this table. i love bone marrow...every time i see some beautiful bones at the market i HAVE to get them. it's simply something you must try. 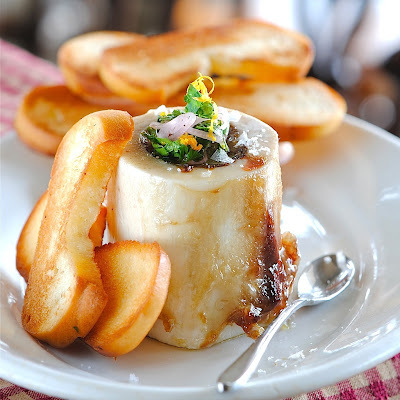 easy to prepare, makes a stunning presentation and a great conversation piece at your next dinner party. i have written about marrow in the past... Rendering Bone Marrow and Marrow with Walnut Pesto, but this time i had the idea that a nice citrus tarragon gremolata along with pickled shallots would be a good balance for the warm fatty marrow. i also had just bought wonderful Butter Bread from 85c Bakery. BONE BUTTER on BUTTER BREAD...!!! i just discovered 85c here in Irvine. if you haven't been to one, i highly suggest going for the experience. there is always a crowd. you pick up your tray and tongs, load up on all kinds of beautifully baked goodies and proceed to the zig zag line that works like a line at an amusement park.. the baked goods are warm and fresh coming out every few minutes marked by someone in uniform yelling out,"fresh bread! "...you'll end up buying things unknown and way too many pastries, but it's all fun. i have yet to try the Salted Coffee that is supposed to be outta this world AND one of their signature drinks...next time. place shallots in a small bowl with lemon juice, cider vinegar, a large pinch of sugar, a small pinch of salt and enough water to barely cover. allow to stand at least 1 hour. add oil and juice just before serving to stay fresh. 1 or 2 bones per person, depending on the size. i usually find them about 2 - 2 1/2 inches long at a regular market. 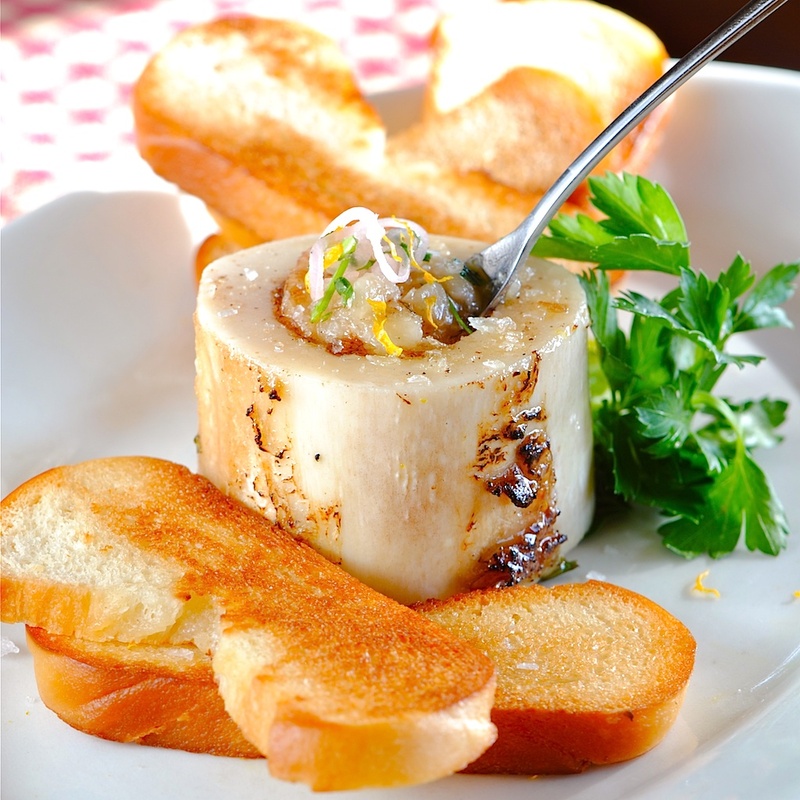 place bones in an oven-safe dish...standing on end. roast at 450 F degrees for approximately 20 minutes...depending on size. watch them...don't overcook or too much fat will render and the marrow will become slightly chewy. sprinkle with flaked sea salt and crushed pepper. 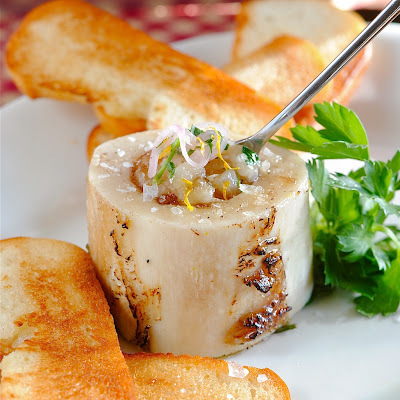 PS...if you are interested for more in depth information and visuals... i found this post by The Hungry Mouse VERY helpful for those "first-timers" unfamiliar with roasting bone marrow.... great pictures of "how-to" and what to expect when roasting. Oh yea baby - I love it too!! Mmm, mmm, mmm. One of my earliest food memories was my parents sitting at the dinner table, teaching me how to scoop out and savor that glorious marrow. So glad you did a blog post about it. 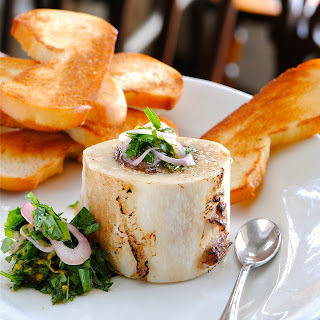 We here are big fans...no, BIG fans of bone marrow. We are even ready to gnaw at bones to get to them if required! 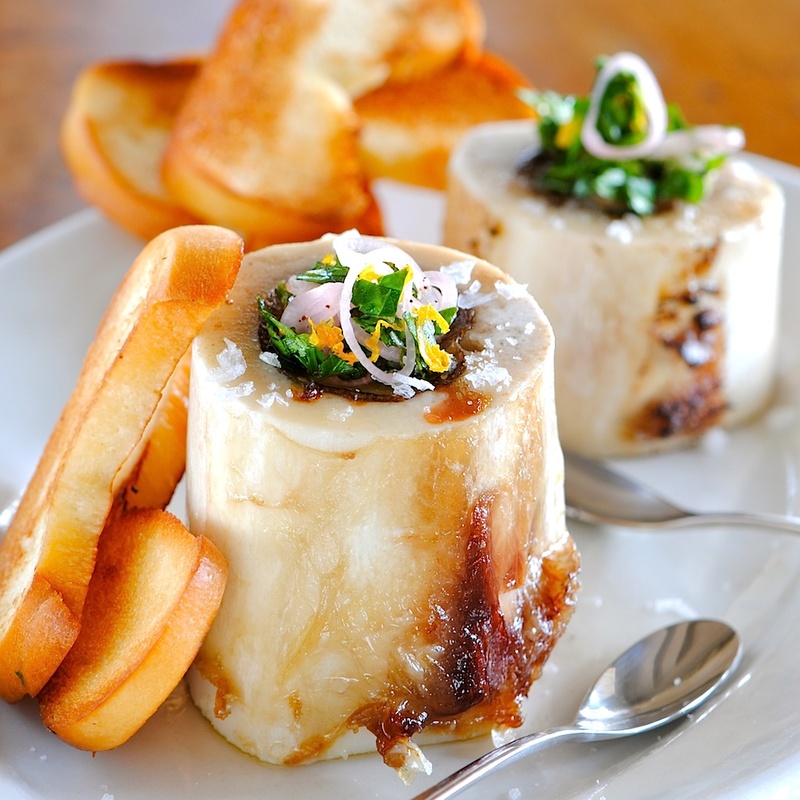 And your roasted bone marrow looks delish. Jules, where in So. Cal did you get your marrow bones? I've found them in Vegas, but not in OC.